While a monk-based vocal ROMpler is obviously something you have to really need to actually drop €199 on, Cantus is the one to get! Very impressive results. Offers plenty of depth. High quality samples. Expensive, but worth it to the right buyer. 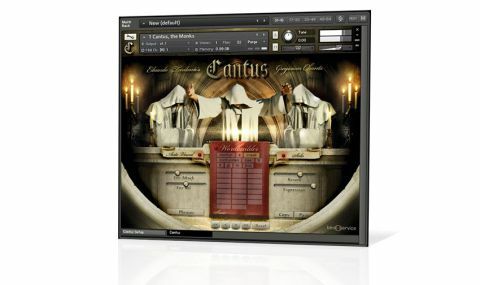 A companion Kontakt library to his Shevannai: The Voice of Elves, Cantus sees producer Eduardo Tarilonte doing the same again but with a choir of Gregorian monks. "'True legato' vowels are used to transition between words, and the results can be truly incredible"
A keyswitched library of 24 suitably ecclesiastical Latin words (inferno, corpus, kyrie, lacrimosa, etc) serves as the foundation of the main Cantus instrument. These can be played and pitched as they are, or deconstructed, syllable by syllable, and turned into new words and phrases. "True legato" vowels are used to transition between words, and the results can be truly incredible. Another instrument provides 20 chants, made up of some 400 phrases, while 19 "soundscapes" take things off in various strange directions. Control is given over playback speed, envelope shapes, legato fades, reverb and more. While a monk-based vocal ROMpler is obviously something you have to really need to actually drop €199 on, Cantus is the one to get. Even taken in a broader soundware context, like its pointy-eared stablemate, this is a spectacular achievement.